Goodbye Dogs we will never forget you. Our first week in Mythic Antorus has Garothi falling! Good work everyone! Argus cleared on H and picked up Mythic Garothi Worldbreaker (W558) this week as well and some poking on dogs. More to come! For now we enjoy our birdies. Fatcat had to be lifegripped to the roof because he doesnt have flying #exposed. We also did get M Maiden down before ToS cutoff, but lets not talk about tomb.. tis a silly place..
Desolate Host goes down without much fuss. 5/9m. Mistress next.. do we have to? Argus? please? 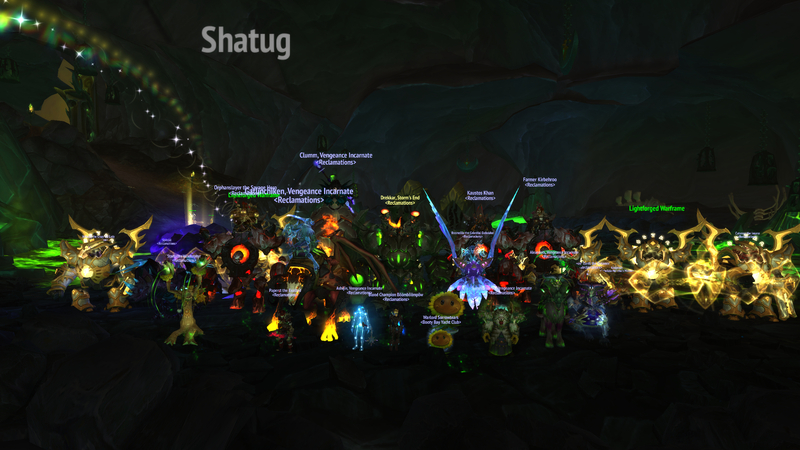 This week we took Aluriel out for a meet n greet with Tichondrius and star gazing with Etraeus. She wasn't too interested in her demonic overlord and dipped out under cover of darkness, but she was happy to help entertain in the planetarium. Will the evil Lord Zedd destroy Outlol forever? Find out next year on Mighty Morphin Reclamations! Because of Suramar feasts being buffed to give 500 primary stats, we will be starting a new Weekly Quest to collect food for the raid. This quest will reward 200 EP a week. You can claim the 200 EP reward once a week. Keep in mind that if everyone in the raid completes these quests, you will not need to farm 375 food for yourself each week for raid, as we will be using feasts instead. This quest is available immediately.